This has been a yuge rodent year, deer mice (Peromyscus spp.) in particular. Some friends who live in a similar foothills ecosystem visited last week, and they agreed. One said that her mother, who lives next door, had trapped 66 mice this summer. And we are just now getting to the cooler weather when they start invading our house in earnest, only it is more like last autumn's invasion never stopped. 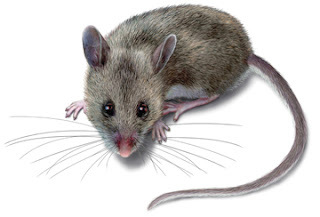 I had set traps that I patrolled each day in the garage and connecting basement, but now the Mice are in the house upstairs. When they ran around on the kitchen counter and gnawed on vegetables left out, we were annoyed. When we found Mouse turds in the bookcases, we were a little disgusted. When one got into the bedroom and awakened us at night with its rattlings and rustlings and chewing, we were highly annoyed, especially M. who is a light sleeper at the best of times. And yesterday when I discovered that a Mouse had chewed the line between the telephone jack and my DSL modem/router, I was ready to declare war. Finding Mouse turds on my desk is one thing, but losing the Internet is serious to someone who works at home. A red line has been drawn. There is no more "Reset" button with the Mice. Thus the battle has begun. The first step in our larger strategy is to reclaim the bedroom, where Mouse forces had struck at our communications infrastructure. Repairs were quickly made and one of our best traps deployed in case the Mice return. Last night there were no Mouse disturbances. As we reclaim the living space, having blocked a key infiltration point (where the TV antenna cable enters the living room through the floor) with steel wool, we will again take the battle to the Mouse beachhead, the attached garage. Some food caches have already been located and destroyed. While sunflower seeds for the birds are stored in a lidded container, we had been leaving the feeders out when we brought them in at night (because of bears). No more! Now the feeders go into an empty garbage can with a lid so that they are not subject to nocturnal pilferage by Mouse insurgents. At this point, some readers may ask, "You speak of wishing to involve indigenous forces such as Foxes. Why not deploy Cat commandos? They are silent, nocturnal, and effective." Yes they are, but the High Commissioner, even though she has great affection for Cats, is worried about ethnic friction with the Dog element. Unlike our previous Dogs, who lived side by side with Cats although they could never speak Cat clearly, this Dog (a/k/a Problem Dog or Rehab Dog) has had no previous Cat training. She fears the consequences of introducing Cat forces into what he considers to be his exclusive area of operations. Therefore, rather than quick surgical Cat strikes, we fight a war of attrition, complete with holding cells and deportation back to Mousistan (a location about a mile up the road, where I left the rattlesnake). Good post, the mouse population will probably collapse this winter -- except those that have taken up residence in your home where it's warm and cozy and food may sometimes be found. I wish you more luck with your current strategy than General Westmoreland had with approximately the same constraints in the late war. May the force be with you!